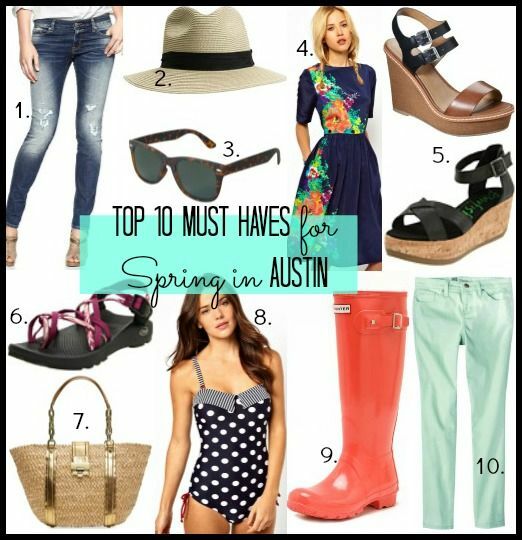 Top 10 Must-Haves for Springtime in Austin. Well...so when coming up with this list, I became aware of the fact that one did not have to exclusively live in Austin to obtain and own the above items. I'll give you a sec to recover from that shock. But these 10 little essentials ARE geographically specific to my southern gals living in this warmish Spring, as I hear snow is still falling on much of y'all up north and you probably won't even speak the word "swimsuit" for another couple of months. And let's just talk about how seriously in love I am with that dress! (Mother's Day gift?) And just FYI, I'll be living in my flatforms starting tomorrow. Well, scratch that. Tomorrow is going to rain, so I'll have to reach for #9....but the next day, flatforms all the way. Do you have any 'must-haves' for Spring....or Summer for that matter? Are they old staples or new pieces you plan to add to your wardrobe this year?